Gambit: Free Play Games, Real Cash Rewards. Want the opportunity to double, even triple your SB? This is your chance, with Gambit Rewards! When you convert SB into Gambit Tokens, you can use it to play games like "Pick the Winner” based on NFL, UFC, NBA, and other sporting events. Register now for a free Gambit Rewards account: www.gambitrewards.com. Please allow 3-5 business days for Gambit Tokens to be credited to your account. You will be notified by email once the transfer is complete. *Gambit Rewards is not affiliated with Swagbucks, and Swagbucks is not responsible for your Gambit Rewards account, the operation of their site, or the conduct or results of any games. 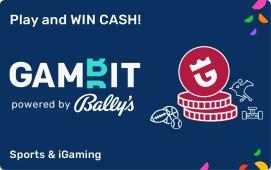 Registration with Gambit Rewards is subject to the terms and conditions of their site. U.S. residents over the age of 21 only; void where prohibited by law, for entertainment purposes only.